This is a gentle, beautiful and flowing Qigong exercise routine that is both a joy to do and deeply relaxing. It places emphasis on synchronizing the 18 movements with proper breathing techniques. The following licenses (in alphabetical order) can earn 5 CEUs for an additional $5 fee. Check the box below to add CEUs before clicking on “Register”. Tai Chi Qigong Shibashi is a Qigong exercise based on the philosophy of Tai Chi and extracts some of the best movements from the Yang style Tai Chi Chuan. It places emphasis on synchronizing the 18 movements with proper breathing techniques. It is a gentle, beautiful and flowing Qigong exercise routine that is both a joy to do and deeply relaxing. It can be done standing, sitting in a chair or a combination of those. 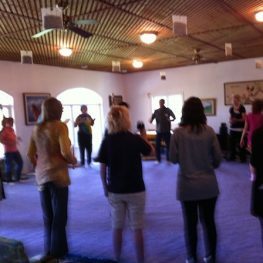 Led by Tai Chi Qigong Shibashi master, John Robertson. Tai Chi Qigong Shibashi was developed by Professor Lin Hou-Sheng in 1979, a renowned Qigong Master, scientist and Master Healer. His remarkable credentials include Professor of the College of Chinese Medicine in Shanghai, Director of Qigong Research Institute in China and Honorary President of the International Society of Natural Cures. It is designed to improve the general health and wellbeing of the practitioner. The gentle rocking motions and stretching movements improve circulation and digestion. The chest exercises and controlled breathing are good for lung conditions and asthma. And the overall effect of the exercise is to reduce mental stress and physical tension carried in the muscles of the body. The exercises are very effective and easy to learn by adults of any age and fitness level. The practice can be done standing, sitting in a chair or a combination of both. This is the reason why over 10 million people worldwide practice Tai Chi Qigong Shibashi and it is considered a national health exercise in both Malaysia and Indonesia. John Robertson is a T’ai Chi Chuan, Qigong and Martial Arts instructor. He holds a 3rd Degree Black Belt in Tang Soo Do Karate with The World Tang Soo Do Association, is a Level VII Master Instructor with World Ki Gong (CN: Qigong) and is a Level III Advanced Qigong Instructor with The National Qigong Association. John is also a certified Reiki Master Instructor, reflexologist and an ordained minister. He has received training in the US, UK and China. John also has an interest in acupuncture, acupressure, Traditional Chinese Medicine (TCM), the I-Ching and metaphysics. He believes that understanding these fields and more is crucial to the effective and responsible practice of all forms of healing and martial arts. The message he conveys to his students is one of healing and non-aggression. In other words, find peaceful, energetic ways to help heal the body, mind and spirit of those we interact with so the use of self-defense techniques is only considered as a very last resort.